Johannes Brahms, composer and pianist, was born on May 7, 1833 in Hamburg, Germany and died on April 3,1897 in Vienna, Austria. Brahms is the last of the 3 B’s of music: Johann Sebastian Bach (1685-1750) of the Baroque Period (1600-1750), Ludwig van Beethoven (1770-1827) of the Classical Period (1750-1825) and Brahms of the Romantic Period (1825-1900). Most of the major works for the clarinet have been written for friends of the composers: Mozart (1756-1791) wrote his Trio, K. 498 (for clarinet, viola & piano), Quintet, K. 581 (for clarinet & strings) and Concerto, K. 622, for clarinetist Anton Stadler (1753‑1812); Ludwig Spohr (1784‑1859) wrote 4 Concertos and various other solos for clarinetist Johann Hermstedt (1778‑1846); and Carl Maria von Weber wrote his Concertino, Op. 26, Variations, Op. 33 (for clarinet & piano), Quintet, Op. 34 (for clarinet & strings) and 2 Concertos, Op. 73 & 74 for clarinetist Heinrich Baermann (1784‑1847). Johannes Brahms was no exception, he wrote his Trio, Op. 114 (for clarinet, cello & piano), Quintet, Op. 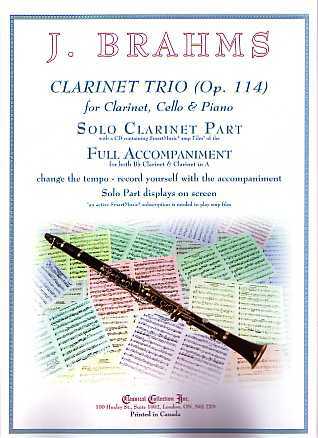 115 (for clarinet & strings) and Two Sonatas, Op. 120 (for clarinet & piano) for clarinetist Richard Mühlfeld (1856-1907). Brahms had “retired” from composition at the end of 1890, sending his publisher Simrock a note: “With this note you can take leave of my music, because it is high time to stop”. The following year he heard Mühlfeld playing clarinet in the Meiningen Court Orchestra, which had been offered by conductor Hans von Bülow for testing any new works which Brahms might compose. Brahms was so moved by Mühlfeld’s playing that he wrote the Trio (Op. 114) and Quintet (Op. 115) during the summer of 1891; both works were premiered by Mühlfeld in Berlin in December, 1891. By mere coincidence, Mozart had written his Clarinet Quintet (K. 581) a little over one century earlier - completed on September 29, 1789 and first performed on December 22, 1789 - one of the works which Mühlfeld played for Brahms in a private performance after their first meeting. In the summer of 1894, Brahms wrote the Two Sonatas (Op. 120), which were premiered in Vienna in January, 1895 by Mühlfeld, with Brahms playing the piano part. Brahms and Mühlfeld performed the sonatas many times, in fact, Brahms enjoyed performing with Mühlfeld so much that he actually gave Mühlfeld the original manuscripts of the sonatas and the performance rights fees for the two works.